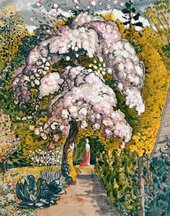 Samuel Palmer Hon.RE (Hon. Fellow of the Royal Society of Painter-Printmakers) (27 January 1805 – 24 May 1881) was a British landscape painter, etcher and printmaker. He was also a prolific writer. Palmer was a key figure in Romanticism in Britain and produced visionary pastoral paintings. Moniza Alvi presents her poem on Samuel Palmer's Coming From Evening Church.